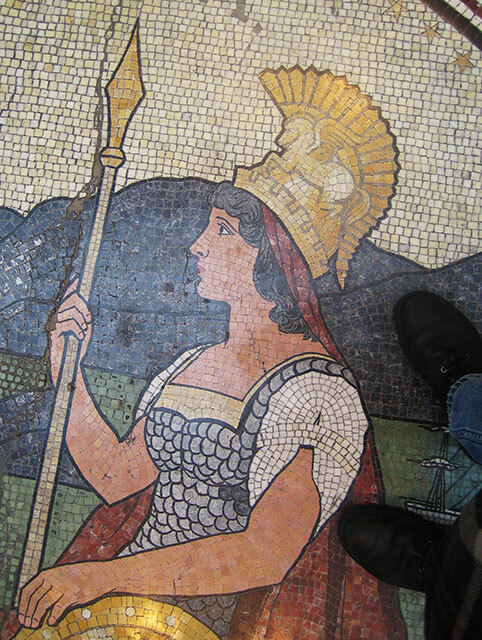 Here’s the thing — I love San Francisco, I love history, and I love walking. Luckily for me, there are a billion walking tours out there, and every so often I take one. I do my best to keep my know-it-all mouth shut and learn a thing or two, pick up a few ideas for the podcast, and take some notes for you. And though ratings systems can be problematic, they do provide a useful shorthand, and I promise to ruthlessly avoid “grade inflation”. That said, your mileage may vary. It was a rainy Saturday and I had only a two-hour window, so imagine my delight when the one tour offered at that time was indoors! I have a somewhat geeky interest in things urban-transport related, so the Ferry Building Tour was right up my alley. As I mentioned to our guide after we’d tramped around the premises for an hour, at their very worst the tours offered by the San Francisco City Guides are pretty good — and this was a great one. 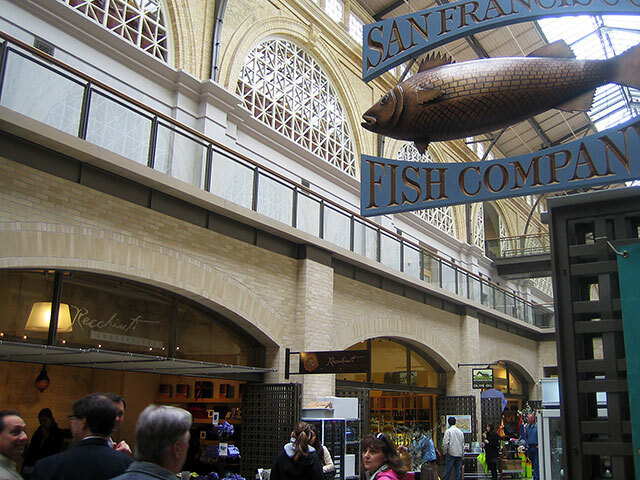 You might imagine that a tour of a single structure might be lacking in interest, but the Ferry Building is packed with visual interest and history. And we were lucky enough to have Paul Cooney as our guide, not only a knowledgeable and very personable volunteer, but someone who’d actually helped develop the tour after the building’s 2003 reopening. The tour outlines a brief history of San Francisco public transportation, the history of the building itself through the years, culminating with its recent restoration and resuscitation as a high-end marketplace. There’s a terrific information display located right inside the front doors, but this tour took us even further. Those lovely chimes? A CD of Big Ben! Owned by 16 different city agencies — ouch. Our guide was well supplied with a sheaf of vintage photographs, which he deployed strategically to underscore stories of the various phases of the building’s life. 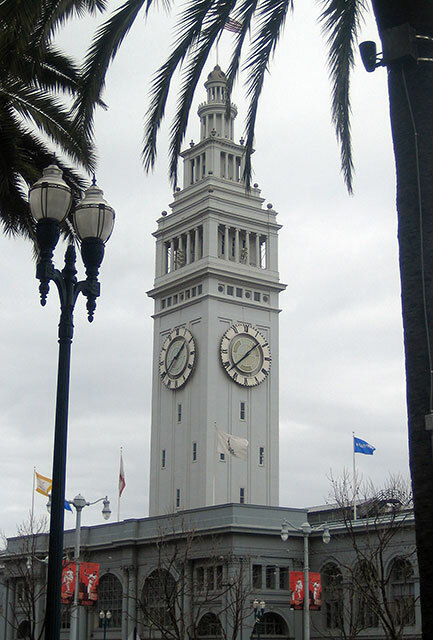 The Ferry Building survived the 1906 Earthquake, playing a crucial role in shuttling survivors to safety in Oakland. It took the arrival of the automobile to dislodge the ferry’s key position in the transportation system, but it was our beloved pair of bridges that really did it in in the 30’s. Then came the elevated Embarcadero Freeway, which — though thankfully only a memory now — is still shocking to contemplate. The Ferry Terminal was severed from its city for decades, and during that decline, a few unfortunate structural alterations were made. The ’89 earthquake and the Dot Com boom conspired to give the building a new lease on life. The quake motivated the city to remove the Freeway, and the influx of cash into the city finally turned the reinvention of the old Terminal into a winning proposition. 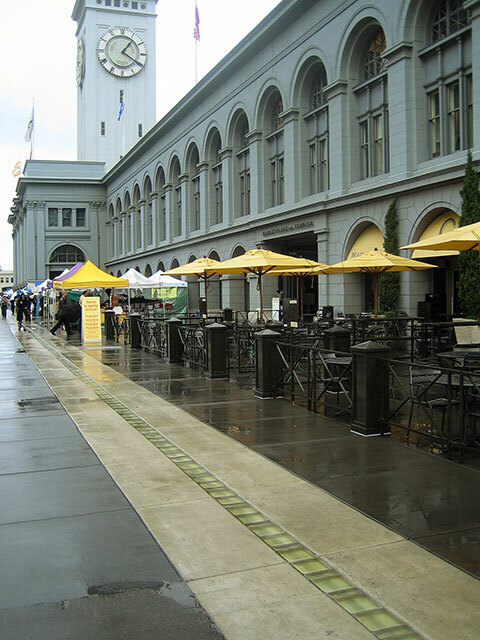 Though the market crash in the early 90’s made the investors sweat, The Ferry Building’s new life as a sort of high-end marketplace has become a virtually unqualified success. The renovation was not a slavish recreation, but serves the building’s new-found life as an elegant public marketplace. The high-end slickness of it all may be offputting to some — a caviar shop and organic mushroom stall can be found within a few paces of each other — but you can also just grab a quick salami sandwich from Acme Bread and wander the well-lit corridors enjoying the place like a tastefully arranged museum of food. You bet. Paul kept us entertained and amused throughout the walk, mixing personal reminiscences, reflections and deep San Francisco knowledge with the history of the building, and was even able to clarify certain points to a pair of German tourists in our group in their own language. And if you draw another guide, have no fear, they’re all well-trained and enthusiastic — and it’s a pleasant stroll through an elegant structure, not only restored but buzzing with life.